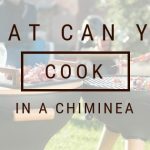 It’s almost certain that if you’ve ever tried your hand at outdoor cooking or been to a barbecue then you’re at least passingly familiar with cooking hot dogs, burgers, grilled corn, steaks, and the usual barbecue classics. If you’ve ever been camping then you’re almost certainly familiar with the good old hot dogs on a stick and a baked potato in the coals. 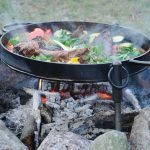 There’s a great variety of savory cooking that is well known and appreciated outdoors. What are less well known perhaps are all the desserts that can be cooked outside as well. The world of desserts is vast and those with a sweet tooth are creative and determined. To start with what is probably the most common and definitely the easiest dessert, there are roasted marshmallows. Stuck on a stick and roasted to caramelized perfection, these sugary bites of heaven are just the beginning. These are quickly transformed into smore’s with the delightful addition of some chocolate and graham cracker cookies. 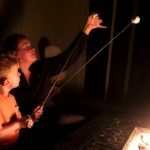 Smore’s are a childhood staple in many fire pit and camping adventures and can be customized with whatever you might wish such as a drizzle of caramel sauce or the addition of sliced strawberries. A fun twist on the classic cinnamon rolls that’s great for around a campfire! Carefully unwrap an unbaked cinnamon roll and wrap it around your skewer, piercing the ends to keep it on your stick. You’ll only need half a cinnamon roll or less per skewer. 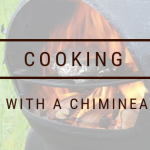 Hold it over the coals like you would to roast a marshmallow until the cinnamon twist is baked to golden brown perfection and then drizzle with icing. If you want the deliciousness of a fresh baked cinnamon roll and don’t mind a bit of a longer wait, you can simply wrap an unbaked cinnamon roll in heavy-duty aluminum foil and place it in the smoldering coals of your fire to bake for about half an hour. Just make sure to turn it a time or two so that it bakes evenly. Drizzle it with icing when it’s done and enjoy! Grilled peaches are simple and easy to do on a clean grill placed over your fire pit. Add some nuts and brown sugar in the middle to spruce them up. Grilled pineapple is another delicious option that also lends itself well to being roasted like a marshmallow in chunks. Sprinkle a slice of pineapple with some sugar or roll a chunk in sugar to achieve a beautiful caramelized layer that compliments the tartness of the pineapple. It’s easy to bake apples just like you bake a potato. Just wrap it up in some heavy-duty aluminum foil and bake it in the coals. For a stuffed baked apple, core your apple first or split the apple in half before coring to get two bowl shaped pieces. Fill the apples with a mixture of oats, butter, brown sugar, and cinnamon. Add in pecan pieces, raisins, and cranberries as desired. If you have a split apple, fit the two pieces together like a sandwich. Once filled, wrap your apples well in foil and nestle them in the coals. Leave them to bake for 15 to 20 minutes and then carefully remove and unwrap them. Let them cool just long enough so you can eat them without burning your tongue! These popular desserts are great for camping since there’s no foil needed! To start, slit your banana lengthwise from top to bottom about three quarters of the way through from the inside so that it looks like a little boat. Then stuff the banana with your desired toppings. Chocolate chips or chunks, marshmallows, peanut butter, and pecans are classic toppings. The banana skin serves as the cooking vessel but if you’d like you can wrap the banana and all the goodies inside with tin foil to keep it nicely together. Bake the banana around the edge of the fire, turning once halfway through, or on top of a grill, for 10 to 15 minutes. Carefully open up the banana and scoop out all the deliciousness! A newer trend that shows the truly creative side of the need for desserts is the orange rind cake where a cake is baked inside a hollowed out orange rind. Chocolate cake works best since the flavours of chocolate and orange go together so well but feel free to use whatever flavour you like. To start, mix up some cake batter. Boxed cake mixes are the easiest but feel free to make your own simple sponge cake batter. Then slice off the top of an orange and carefully scoop out all of the orange fruit. If you leave a little of the flesh around the edges it will result in a cake with a stronger orange flavour. Fill the orange about three quarters full with cake batter and place the top back on the orange. Wrap the whole thing in heavy-duty tin foil and carefully place the package upright in the smoldering coals. Let the cake bake for about half an hour, turning it once or twice to ensure even baking. Carefully remove the cake and let it sit unwrapped to cool a few minutes before digging in with a spoon! Jazz it up a bit with different batters or swirling in some peanut butter before baking. After baking add some whipped cream or a splash of liqueur! As you can see you there are many options to satisfy a sweet tooth while cooking outside. Even better, you can easily cook any of these delicious sweets in whatever backyard apparatus you happen to have handy! Electric or gas barbecues, fire pits in your backyard, chimineas, or a simple camp fire pit on a campground will all do the trick to let you quickly whip up an outstanding dessert that’s sure to deliver for your sweets craving. So let your imagination run wild and don’t forget to share with friends!